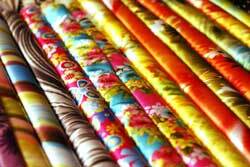 Fabric shoppers are turning to the internet to buy fabric online buy fabric online. It's often more convenient than going out to a brick and mortar fabric store. It also saves gas. Online fabric stores do not need to pay a lease or have many retail employees. That's why items can be less expensive than they might be at a normal store. However, buying fabric online has some major pitfalls you need to be aware of if you are going to have a successful shopping experience. This is not to say that you should not do it, just that you need to know what you are doing. Fabric Shopping Online Can Be Enjoyable! Keep the following points in mind and you'll see buying fabric online can be easy and fun! You are able to narrow down your search to a specific type of fabric quickly, much quicker than digging through bolts of fabric in a physical store. Browsing through several stores takes minutes rather than hours! Save a little time. Have fabric delivered right to your doorstep. There's great price deals online. Sign up for e-mail alerts from your favorite stores and never miss a deal. Specials are offered regularly. Shopping for fabric at a physical store allows you go in to see and touch the fabrics you are thinking about buying. You need to be able to hold fabrics side by side when matching colors and fabric combinations. You may also want to test the drape of a fabric. Go by the written fabric description more than by the image on your screen. Stick to fabric designers you have had experience with in the past. 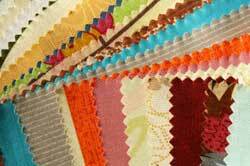 You're more likely to know what you'll be getting as far as a fabric's quality and color tone. Request samples when possible. These are often available and you can purchase them ahead of placing your big order - make sure it's the fabric you really want, even if the price is right. Is It Really Less Expensive To Purchase Fabric Online? Fortunately, many online fabric stores try to keep these larger purchases available to everyone by having flat rate shipping fees. This way, a customer who buys something small and light might pay the same shipping rate as one who places a larger heavy order. The first person's shipping costs will balance out the shipping costs created by the larger order, also creating an incentive for placing larger orders. Remember to take some time to shop around online. Check out prices from several suppliers as prices can vary quite a bit. If you are ordering from outside the country, you may have to pay customs as well. Research Your Online Fabric Store - How Does It Rate With Other Shoppers? When looking to buy fabric online, you need to know that the online store is reputable, organized and respectful towards its customers. You need to read other shopper's reviews and opinions on a company you would like to buy fabric from. Discover what experiences others have had when placing orders. Get some feedback by doing a search online or through sewing forums. Look for a secure site, read its policies, and stick to purchasing familiar top brand name fabrics.